In this extremely dry basin is a flat, bone dry lake known as Racetrack Playa. In this dry lake bed are stones, ranging from pebble sized rocks all the way up to boulders weighing over 700 lbs. These rocks, for reasons no one has been able to figure out or explain, move all by themselves across the dusty, cracked surface of the lake bed. These rocks, which are usually hundreds of yards from any source area, move across this basin leaving tracks in the surface of the dry lake bed. The trails left by these rocks vary in the length, distance and direction. Some of the rock trails show signs of curving gently and slowly in any given direction while other will have made sharp, abrupt turns when changing direction. The majority of the trails seem to go in a south to north direction. Many of these rocks have traveled distances of over 2 miles with no real discernible points of origin. Some of the rocks seem to have broken off the cliffs at the southern end of the playa, and moved towards the northern end. The nature of these trails have many scientists believing that the rocks' movements indicate that motion happens only when the playa surface is wet, however this has never been proven and many people doubt that the massive boulders in the playa could be moved by the fairly gentle winds that blow rather infrequently across the basin. The tracks left by the smallest rocks usually do not survive the rare rainfalls, while the tracks made by those massive boulders can last for as long as seven years. Despite years of research and many investigations, no one has ever managed to witnessed the rocks moving. No one has ever been able to prove any of the numerous theories that have been suggested by many scientists either. Gravity has been long since ruled out of the equation because the rocks are moving ever so slightly uphill due to the fact that the northern end of the playa is a just few centimeters higher than the southern end of the playa. When this strange and unique phenomenon was first discovered by white settlers around 1900, some educated observers had the idea that natural magnetic forces were the reason behind the movement of the rocks. In the late 20th and early 21st century, a few scientists believe they may have have solved the mystery of the moving rocks of Racetrack Playa. They believe the movement occurs when one of the rare rains wets down the lake bed just enough to make a slick, sticky mud, and then a good strong wind which can get up to around 70 miles per hour on occasion, blows the rocks around. However, this theory does not explain how the very heavy boulders can move around due to the fact it would take a much stronger wind to move these huge rocks--nor, that in spite of long hours of patient observation during these rare wet times, no one has ever been able to observe the rocks moving. 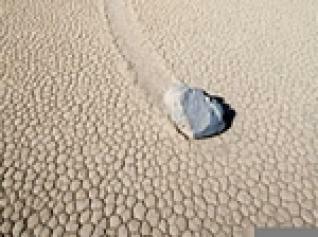 So, what is the real reason behind the mysterious moving rocks of Racetrack Playa? Who knows. It may forever remain one of the wonderful, enduring mysteries of our world.